Today started out with a trip down memory lane and a bit of jealousy. 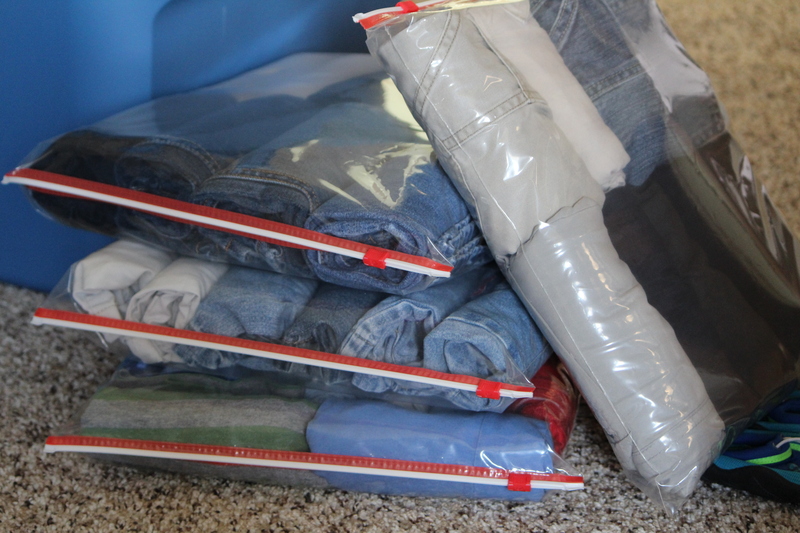 Rolling up Elijah’s outgrown 4T clothes (thankful that some survived him relatively unscathed) for Ezekiel to wear down in Costa Rica, I marveled that a 4-year-old’s entire wardrobe could fit in four 2.5 gallon bags. My first four bags are causing a crisis discussion of want versus need. Size discrimination, you get me every time. My desire for “just in case” surplus works against me here, too. But what if I fall into one of those uncovered man-holes in San Jose and tear these? I’ll only have 7 others left. We are sorting priorities as we distill our life down into portable size. Really, we are beyond blessed. A team from our church is flying down to the Home of Life this Friday and pack-muling a bunch of stuff for us. Four 23-gallon totes are filled with the best of our kitchen & bedding, and 3 rolling duffels of clothes & toiletries are standing by. Someone will soon be on their way to buy more 2.5 gallon bags because it is a beautiful thing to see all those rolls lined up side by side, grouped by wearer, mostly inoculated from TSA rummaging and in-transit dousing (Dear person whose fish juice leaked all over and into Matt’s suitcase on the way home from Florida, God forgives you, and He’s helping me to come around, too). We have also been pelting questions upon in contact with the saintly Big Brother family helping us to find a rental house and get acclimated in San Jose for language school. Two houses are jockeying to be our new nest and we’ve even been able to see some pictures. In the process of selling our house and obsessively staging for each showing, it’s amusing to compare the expectations of American buyers with Costa Rican renters. Without square footage numbers, hot water in one of the showers, or even a complete assurance of a refrigerator, we are leaning toward the house in the quieter neighborhood, and praying over the rent and availability timeline. And so, as we debate whether to use our luggage real estate on measuring cups or peanut butter to reach the magic 49.9 lbs, we give thanks for the abundance that we are picking and choosing from, for the necessity of paring down that gives us the freedom to let go of what we don’t need (and to realize that we don’t need it). We trust the Lord to guide us and provide what He decides is “every good thing” for our family. Perhaps not all we might want, but definitely all we need. He’s already doing it. The space Ezekiel’s clothes don’t need is a perfect fit for chocolate chips. This entry was posted in Kris' Heart, The Launch and tagged chocolate chips, every good thing, gallon bags, packing, priorities, Psalm 34, renting, rolling duffel bag, San Jose, storage totes, wants versus needs. Bookmark the permalink. Awesome packing job! I have not rolled clothes for packing for quite some time since I have learned to pack fewer sets of clothing & wash when we travel, but this is a good reminder of how to fit more in when you really need to. 😀 I have the task ahead of me of weeding out the extra baby stuff, and I’ll admit it’s going to be hard to let go of the ‘just in case’ and share with others. Thank you, Chris. Blessings on settling in with brand new baby Larissa. She’s beautiful. If it helps at all, chocolate chips and peanut butter are now easily found in CR. The prices are a bit higher, but it should make more room for other “comfort” items. I’m so glad for that, Angela. Our daughter’s body composition is half peanut butter (and mine is probably half chocolate), so we thought we could beef up some underweight baggage with our favorites. Prices seemed to be at least double what you pay in the states, if I did my colones to dollars conversion correctly. Still wobbly on that one. I’d be happy to hear I messed up. I’m excited to read the blog, I’m a fellow Christian who will also be starting my journey in CR with my two children. I can relate to what you’re going through right now because I’m also going through the hectic process of packing. The Lord has called me to start a missionary work in sarapiqui, heredia Costa Rica . (www.montegetsemani.org ) this is one of the projects we have started in Costa Rica. My family and I will love to meet and fellowship with your family in Costa Rica , God bless. Very nice to meet you, Pamela. We will look forward to connecting with your family. I tried to look up your link, but it wasn’t functioning. Are you taking your blue/purple Tupperware cups with you?